England made the Trump Baby Balloon. 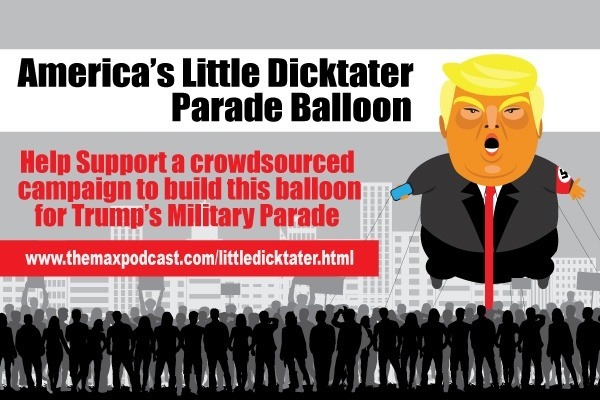 We in America want to make our own Little Dicktater Balloon (American made in Texas of course). Moreover, we want to sail ours at The Little Dicktater’s Military Parade on Veterans Day, November 11, 2018 and everywhere else we can. Let's admit it, the baby is funny, but the fact is Trump is becoming more and more of an authoritarian dictator with serious and real Fascist leanings. We need a more aggressive and realistic version of the balloon to draw attention to his ways. That's why we are calling ours the Little Dicktater*. The costs are high and we need your donations. The 20ft Little Dictator’s Balloon will cost over $7000 to manufacture. The helium costs over $1500 per event and then there is the many ground crew, transportation, lodging, insurance and legal support. Overall we are looking for $10,000 or more. The fact is if we make more than enough we will take this Little Dicktater* anywhere! Furthermore, if you don’t pay for we are going to ask Mexico to!! That’s right, right off the bat, we are asking if any Mexican President - past and present - if they would like to contribute to this endeavorer. Vicente Fox, López Obrador...we're talking to you!